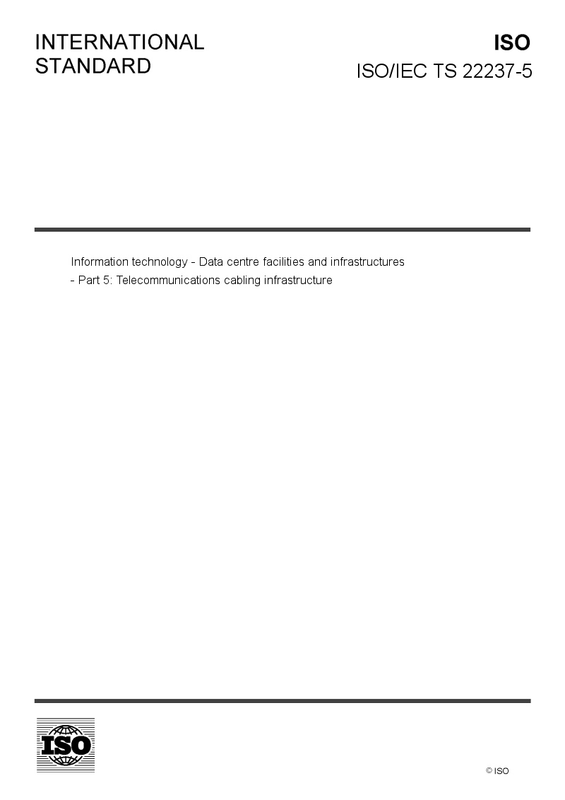 ISO/IEC TS 22237-5:2018 addresses the wide range of telecommunications cabling infrastructures within data centres based upon the criteria and classifications for availability within ISO/IEC TS 22237‑1. ISO/IEC TS 22237-5:2018 specifies requirements and recommendations for the following: a) information technology and network telecommunications cabling (e.g. SAN and LAN); b) general information technology cabling to support the operation of the data centre; c) telecommunications cabling to monitor and control, as appropriate, power distribution, environmental control and physical security of the data centre; d) other building automation cabling; e) pathways, spaces and enclosures for the telecommunications cabling infrastructures. Safety and electromagnetic compatibility (EMC) requirements are outside the scope of this document and are covered by other standards and regulations. However, information given in this document may be of assistance in meeting these standards and regulations.